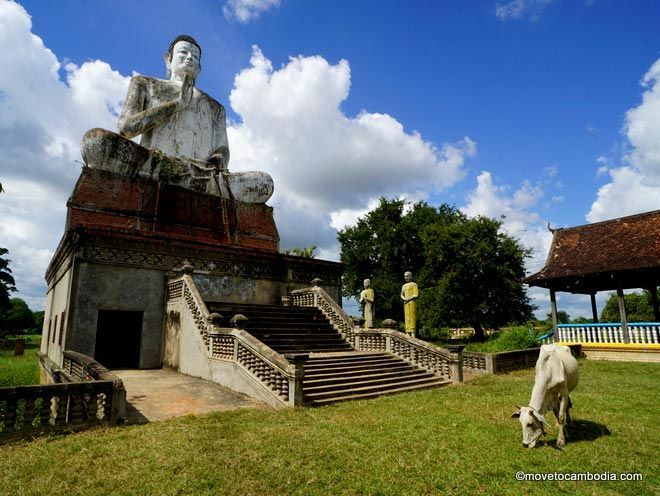 Five hours from Phnom Penh, Battambang often loses to Kep and Kampot for those who want a relaxed getaway, and to Siem Reap and Sihanoukville for those who want a more exciting vacation. While it’s true that Battambang doesn’t have the buzz of Siem Reap’s nightlife or the beauty of Kep’s ocean views, Cambodia’s second-largest city is still worth a visit, sooner rather than later. 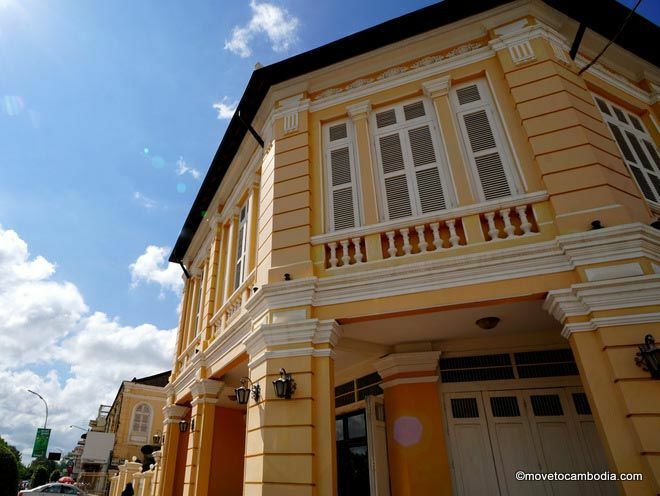 Colonial architecture, bats, dessert: Battambang’s got it all. Let’s start with the obvious. These are the things that make it into the guidebooks – and rightfully so, because they are worth doing. Every evening as the sun goes down at Phnom Sampeu, about 11 km outside the city, thousands of bats take flight, leaving their cave to hunt for the night. It’s a very impressive, David Attenborough-type thing to see. 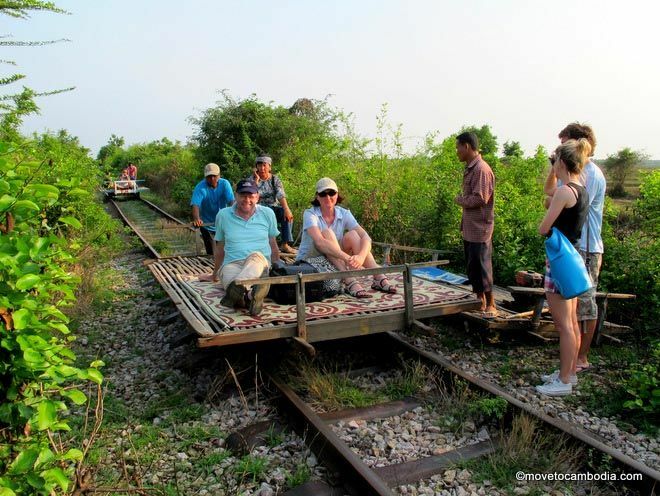 Yep, after years of closure threats, Battambang’s bamboo train is still running and still worth checking out. The bamboo train takes you through the countryside on tracks originally built by French colonial settlers, although fair warning that “train” may be a bit of an overstatement for the slight steel frame that is propelled along by the engine of a motorbike or tractor. The bamboo train isn’t the only way to see the countryside; bike tour companies such as Soksabike offer half- and full-day tours, and Green Orange Kayak rents kayaks to take everything in from the river. No list of Battambang sights is complete without the circus. The Phare Ponleu Selpak circus troupe is good enough to tour internationally, and is a delight to watch in Battambang. 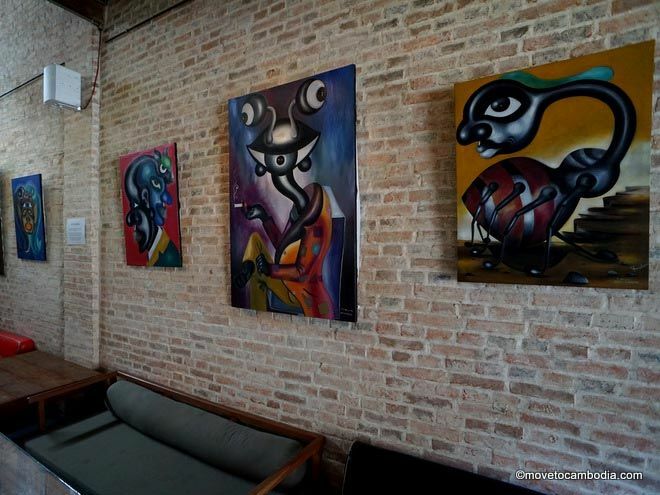 Battambang’s Lotus Gallery is at the forefront of the city’s burgeoning art scene. Battambang has a long artistic tradition. Historically, many of Cambodia’s best artists and performers come from the region. Today, the arts are thriving in Battambang, with many enthusiastic local artists taking the initiative to put Battambang in the forefront of Cambodia’s arts scene. And good news for those tired of Angkor Wat tableaus – there’s nary a temple in sight as the young artists in Battambang explore both personal and political themes in their work. Poke around Lotus Gallery, Sammaki, Make Maek, and Sangker Gallery to see the best of Cambodian art, or read more about Battambang’s art galleries. Don’t miss a meal (or three) at Jaan Bai in Battambang. 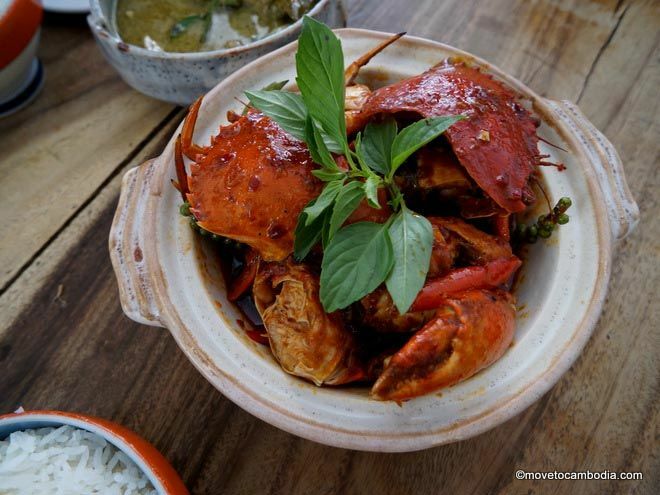 If you’re hungry or thirsty, Battambang offers opportunities to indulge. At Kinyei, try the country’s best coffee, served by 2013 Cambodian barista champion Sakana Long. Ask for her signature drink, the Cambodian cappuccino, or have the street latte, which was Untac Nem’s signature drink when he won the competition in 2012. Go to Choco l’Art Café for dessert. Soline’s delicious chocolate mousse and chocolate hazelnut cake is always available, with a rotating menu of other desserts, none of which ever disappoint. 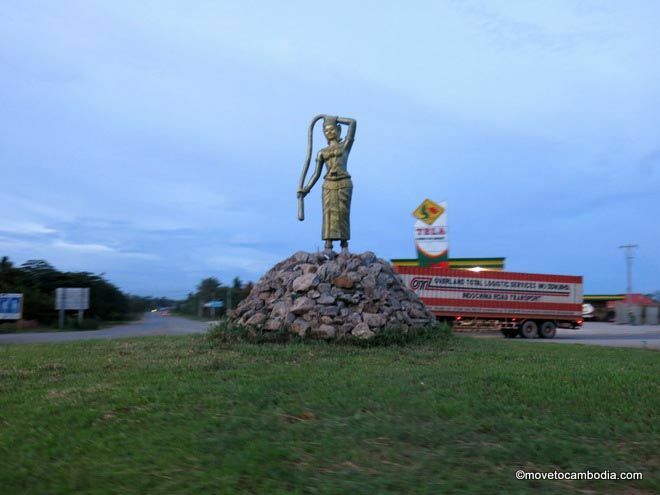 Battambang statue of the legend of “the girl who let down her hair” at sunset. 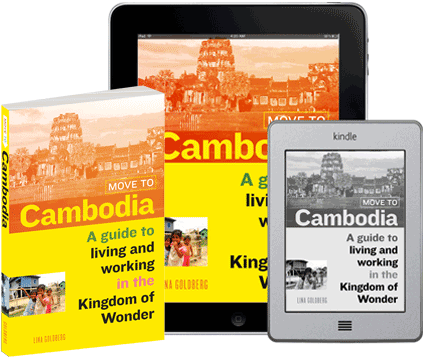 There’s a Khmer saying about Battambang being a sticky place, sticky because many people visit for what they think will be a short time, but end up staying a lot longer than originally planned. Others leave only to find their path leads them back again. So be warned when you visit: you may find it hard to leave. 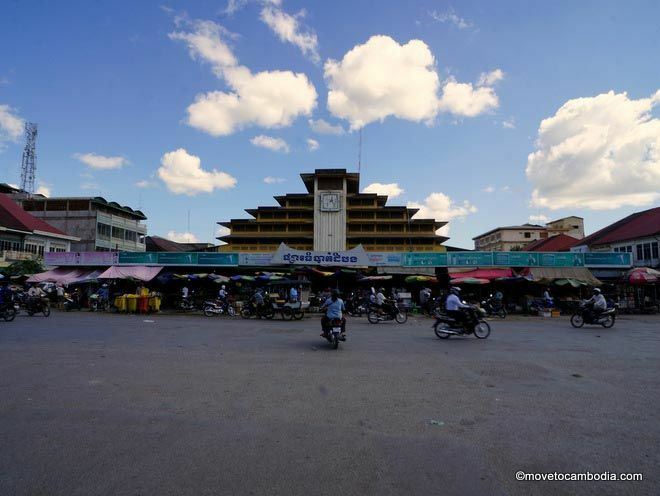 Battambang: it’s not going to be quiet forever. While it’s the city’s slow pace and quiet charm that appeal to many that visit, Battambang may not be slow and quiet for long. More tourists are passing through, and the local government is moving forward on plans to make Battambang more attractive as a nightlife destination. This will include the establishment of a “Pub Street” a la Siem Reap, so it’s likely the city will change quite a bit in the next five years. Visit now to experience Battambang’s sleepy charms, while they still exist. This entry was posted in Battambang and tagged Soksabike, Green Orange Kayak, Phare Circus, Sammaki, Make Maek, Studio Art Battambang, Kinyei, Choco l'Art Cafe, Jaan Bai, Phnom Sampeu, bamboo train, Lotus Bar and Gallery. Bookmark the permalink. Great article about Battambang. I never miss the chance to enjoy the chocolate desserts (yes, I get several each visit) at Choco L’Art when I travel there from Siem Reap. I also caught a great live painting event in front of the cafe last time I was there. Thanks, I love the riverside area. Nice for a walk. Any live music scene information would be greatly appreciated. Hey Warren – the live music scene isn’t the most robust, unfortunately, but Lotus on Street 2.5 periodically has live music (and recently had its first poetry night as well), as does Here Be Dragons. Hopefully the scene will develop a bit more in upcoming years.